Bee Keeping, Is it for you? A few months ago I was watching an episode of House Hunters on HGTV. Ok, my wife was watching it, but I was in the room. In any event, one of the three houses the couple were looking into purchasing was situated next door to a neighbor that had beehives, of the neighbor’s own doing, in their backyard. I was thinking to myself, `who in their right mind would move in next to a house with bees?!?`. To my shock, that is the house the couple chose and in exchange for the couple’s “allowance” of the neighbor to have bees, the neighbor gave them honey anytime they asked for it. Don’t get me wrong I don’t dislike bees. As a home vegetable gardener I completely understand their tremendous importance in the pollination process. It just seemed odd to me to raise bees in my backyard. So instead of writing off the idea of raising bees as some notion of environmental craziness, I researched the topic further to find out the answers to the who,what,where,when and why’s. What I found out through various articles, magazines and newscasts (you can see loads of videos on YouTube), bee keeping is extremely popular. 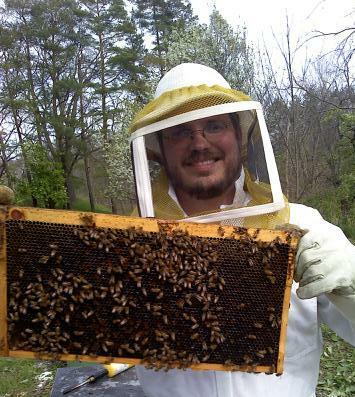 Aaron Warner, a high school science teacher has been bee keeping for 8 years. Aaron recommends before you even get started, to read at least 3 books, preferably recently written within the last 10 years, on the topic. This will give you a tremendous amount of information to make informed decisions. 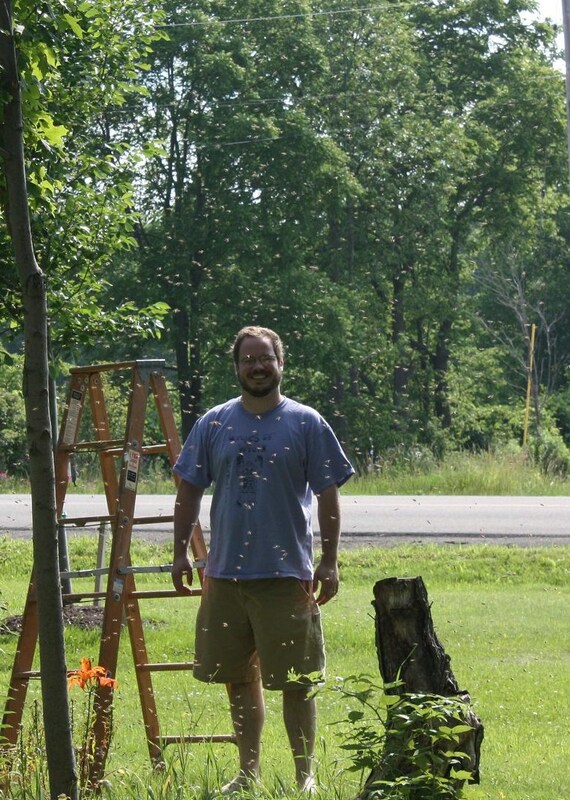 “Start with two hives if possible purchasing nucs of bees rather than packages of bees,” says Aaron, and ”Be prepared to receive conflicting information when you ask beekeepers how to ..... It's not rocket science. Most mistakes are small and very fixable.” I will explain what a “nuc” is in a moment. It sounds fairly simple, but what are the three best tips a seasoned bee keeper can give you if you want to get into the hobbby? I turned to Patrick Freivald, the vice president of the Ontario-Finger Lakes Beekeeping Association (ontariocountybeekeepers.org) and a large hobbyist beekeeper with a roadside stand in Canadice, New York. Here are three tips that Patrick recommends to follow. 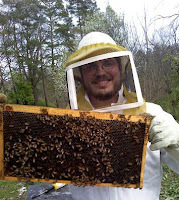 Beekeeping organizations can be found all over the world, and interest in beekeeping is very high. While asking three bee keepers a question will often as not garner four conflicting answers, nothing beats the helping hand of an interested and dedicated mentor. Mentorship, beekeeping classes, and deals on bees and equipment are just a few of the benefits of joining a local group, and membership is almost always free. From mites to bears to nervous neighbors to marketing honey, your local group of bee keepers will have answers to all of your questions, concerns, and problems. Just as Aaron suggested, there are fantastic books out there, Kim Flottum's Backyard Beekeeper, Ross Conrad's Natural Beekeeping, and Beekeeping for Dummies by Howland Blackiston are just three of the dozens of excellent guides for the aspiring apiarist (a person who studies or keeps bees). If you can find them, anything by the late Richard Taylor is excellent. Bee Culture Magazine and the American Bee Journal are both excellent sources of information for beekeepers, whether for new hobbyists or long-time commercial bee keepers. Buy only new equipment from reputable companies such as Mann Lake, Dadant, Brushy Mountain, or Bee Commerce. Old equipment can harbor diseases such as American Foulbrood, which is devastating to any bees in the area, can remain dormant and undetected for decades on old equipment. Foulbrood can spread quickly and most states require foulbrood-infected bees and equipment to be burned -- disheartening and expensive for the new bee keeper, and not likely to win friends amongst his beekeeping neighbors. Be safe; buy new. With all of this bee keeping information in hand you are ready to get started right? Well not so fast, Patrick recommends you take a class on bee keeping as most fees charged for taking the class will also include a “nuc”, short for nucleus colony of bees. Expect to pay about $100 for the course (and bees) but be prepared for the additional costs that most newbies don’t think about which include, woodware, a suit and veil, smoker, and a hive tool, although they are one time costs (or at least should be). Last month experts confirmed nine cases of Listeria in the state of Colorado. First indications point the outbreaks to have occurred from infected cantaloupe, although one family member of an infected person claims it had to be the salmon she ate. Officials are still gathering information as to its cause, but as of right now, cantaloupe seems to be the culprit. With that said, what is listeria and how do we improve our chances of not being infected by it? In the recent cases that have occurred in Colorado it has been the cause of individuals lapsing into a coma up through two reported deaths. According to Dr. Rogers an outbreak in Canada a few years ago caused a mortality rate of 40% of those infected. The transmission of this bacterium usually occurs through contaminated foods such as meat and unpasteurized dairy products. Dr. Rogers says it is rarely found on produce which makes the recent outbreak in Colorado involving cantaloupe so unusual. You can take steps to reduce your chances of infection. Make sure you wash your produce thoroughly and just as important, dry your produce. Any and all meats should be cooked thoroughly as well and the consumption of unpasteurized dairy products should be completely avoided. 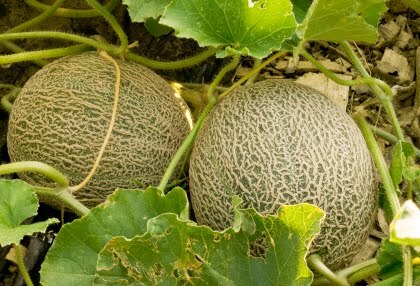 “As far as cantaloupe is concerned, it should be washed and dried and either eaten right away or stored in a refrigerator. Proper refrigeration, with temperatures 40 degrees Fahrenheit or lower, is important for preventing the growth of Listeria,” says Dr. Rogers. Mike Podlesny is the owner of Mike the Gardener Enterprises, LLC, the exclusive home for the Seeds of the Month Club, which has appeared on NBC, ABC and MSN Money as a great way for consumers to save money. A special thank you to Orly Telisman, the Director of Media relations for the Encyclopedia Britanica, for the contributions to this article. In your neck of the woods you may never see a rabbit. Your fuzzy vegetable garden predator may be a deer or woodchuck, but here in the good ole Garden State of New Jersey where I grow my vegetables, rabbits are the pain in the rear of choice. Or should I say, not really of choice, but forced upon me. My kids absolutely love them and from a non-gardener point of view they are cute, look cuddly and lets face it, they are harmless. When was the last time you heard on the news about a killer rabbit wiping out a family of four or a crazy wild rabbit runs loose through Chicago, causing chaos and millions in property damage? 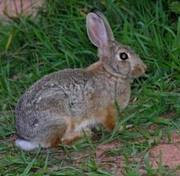 However, as cute and harmless as they are, they would just eat the `bejesus` out of my vegetable garden if I did not take the necessary steps to keep them out. Over the past 10 years I have come up with a simple way to do just that, which I will get to that in a moment, but what I have also come up with are great ways to really piss them off, or so I think. Ok this is an obvious one and for 10 years it has worked for me. I use poultry fencing and make sure the height of the fence is no less than twelve inches. For some reason in the back of my mind I have this notion that the rabbits can leap like deer, so I don`t take any chances. God forbid they get a hold of some genetically modified clover on my neighbor’s lawn, I would be in trouble. I love this one. I know that the rabbits absolutely love to feed on my tomato plants, lettuce, peas, beans, well, ok, pretty anything I plant. I found this out the hard way when I first moved into my house. We didn’t have rabbits in Trenton, where I am originally from, so it never occurred to me that I would need a fence. Needless to say the rabbits had a field day. I think they put on 10 pounds that day. What I do now is, after the fence goes up, I plant items near the fence as a tease. Try as they might to stretch and stick their noses through the poultry fencing, they can’t quite seem to get at my plants. I am still bumbed that I missed out on this one not having my video camera with me that day. But I had some cantaloupe growing in one of my garden beds last year and the vine made it’s way along the top of the poultry fencing. I woke up one morning to find a rabbit, trying with all its might, literally standing up as tall as it could to try and get the leaves from the vine. Tried and tried he might, he never succeeded. So now I make it a point with my vining plants to do this every year and one of these days I will have that camera with me so I can post the video on Facebook for the world to see, well, at least all of the members of the vegetable gardening page anyway. Finally, last, but not least, my faithful man’s best friend, my dog Bear. He is as loyal as they come. Follows me everywhere, barks when a stranger walks by the house, really barks when a strange dog walks by the house, but, beyond all that, he despises rabbits. Although he has never caught one, try as he will, I do my best to at least let him give it a go. When a rabbit is out in our back yard and he can see it through our sliding glass back door he whimpers and cries as to tell me, “Please, please, please, let me go chase him. I swear I can get him this time.” So I open the door, out Bear goes, and the rabbit scampers away. He has only been close once in the five years since Bear has been a part of our family, and when I say close, I mean I had a better chance of catching the rabbit then he did. Ok so I know what the rabbit lovers are saying as they read this article, `How Cruel!`. So let me add this disclaimer, no rabbits were harmed in the making of this article...only my vegetable garden. Here is our Radio Spot for our RocketGrab.com Seeds of the Month Club promotion. What do you think? Every year when the spring vegetable gardening season rolls around my wife always tells me to tone down the amount that we grow. Not because we do not have the room or that we take away space from the kids play area, but because we end up with so many fruits and vegetables that even after donating them to a local food pantry and giving them away to friends, neighbors and family, we always have way too much. I can not disagree with her assessments. By mid July we do have a lot. But come December I would love nothing more than to eat a tomato from my garden. Unfortunately here in NJ we are unable to grow tomatoes due to the cold. That is where canning comes in. My grandmother was an expert in canning. Unfortunately I did not get a chance to learn her skill set so to me canning is still fairly new but I am finding that it is easy. To get a better understanding of canning, I turned to canning expert Linda Amendt. Linda is an award winning cookbook author and also the winner of the international book awards for canning and preserving. So who better to get the dirt (or jar in this case) on canning. 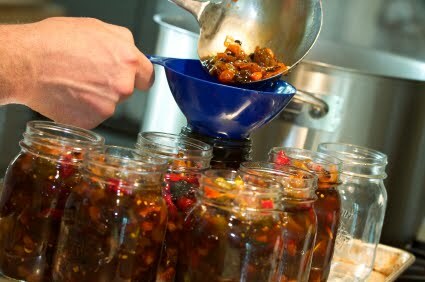 Canning is the process of preserving vegetables in jars. You place the vegetables in jars specifically designed for home canning and cover them with liquid. The jars used, I will get into in a moment where you get these jars, are then fitted with a special two-piece closure consisting of a canning lid and a screw band. According to Linda canning is an easy skill to learn. Just follow a few basic safety rules and techniques and you can create an array of preserves from summer produce to enjoy throughout the winter and into the spring months. I asked Linda where does she find the supplies needed to properly can vegetables grown in one`s garden. She says that beyond the normal tools most people have in their kitchens currently, such as a cutting board and knives, the canning supplies such as jars, lids and screw bands can be found at most grocery stores, Walmart, Target and Kitchen stores, as well as online through website like Amazon. One final note on canning. Canned vegetables are at their best when used within one year. 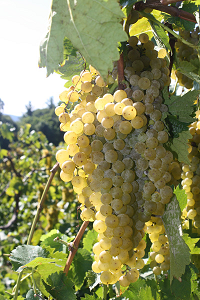 In that time that is when they will have the best flavor, color and texture. After that, although they will be safe to eat (so as long as they are well sealed), the flavor and appearance will begin to deteriorate. Be sure to store your canned foods in a cool, dark, dry location. Heat can cause the seals to fail which could cause the food inside the jars to spoil. Also, exposure to light will cause colors to fade and moisture can cause rust on the lids. With beets, spinach, turnips and other crops done, it’s time to think about what’s next. Indeed, one of the joys of gardening is understanding the seasonal evolution. Many of us can’t wait to get in the garden in the spring – admittedly, long winters in Western New York make me long for the soil. Its good to work on the premise that adding organic matter is the answer to most soil concerns. Cornell Cooperative Extension volunteers offer soil testing at farm markets on a regular basis. Usually analysis is free. Take full advantage. Gardening is a continual experiment. Some things go well, others not so much. Try some companion planting. 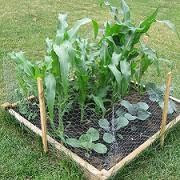 For example, a fast crop like spinach, once established, will tolerate broccoli nearby. As the spinach finishes, the broccoli will begin to take over. As late summer stays cool and turns to fall, that broccoli will yield. And if they don’t grow forth and prosper as we evolve into fall, that’s OK. Learn from it. This is an experiment, four more packages of seeds will be in the mail next month. It’s also time to plant the new garlic crop. 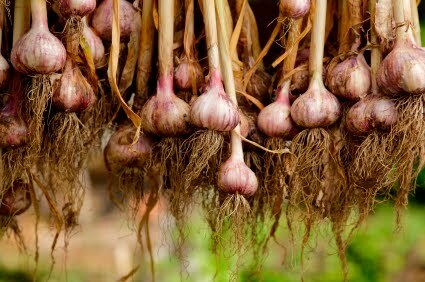 I rotate garlic to different areas of the garden, depending on the year, but it is the easiest and most rewarding crop in the garden. Start with hard neck garlic cloves, preferably from your area. 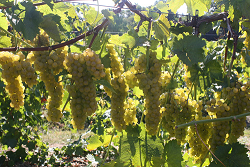 Look for a variety like Rocombole, Polish White, German Red or Russian at a farm stand. Avoid the stuff from the grocery store. Work in good helpings of manure and compost and plant one clove at a time, 6-8 inches apart, anytime between now and early November. You will see beautiful plants in early spring and it may be the easiest thing you have ever grown.